We try and keep ourselves abreast of what is going on in and around Chorleywood by using a number of online resources, as well as numerous contacts that we have with local organisations. If you have some news that you think we've not picked up on, please let us know by e-mailing enquiries@chorleywoodresidents.co.uk - we'd be happy to hear from you! This page contains recent news items, regardless of subject or category. To see older material, see our Archived News page. If you are not on already on our mailing list, please consider joining it. As a subscriber (it's free!) you will receive occasional emails from us, including our regular e-newsletter. Previous issues of our e-newsletter can be found by clicking here. Come join us for the 2019 CRA Community meeting and AGM on Wednesday 15th May 2019 at the War Memorial Hall, Common Rd, Chorleywood, Rickmansworth WD3 5LN. It’s a great opportunity to meet other Chorleywood residents and representatives from various local organisations. Doors open at 7:30pm and the meeting will start at 8pm. Wine, soft drinks and snacks will be provided as part of our usual hospitality. Thanks to the Co-Op for sponsoring the drinks and snacks this year. We are delighted to welcome Daniel du Gard, Common Conservation Ranger and Alec Pinkstone, Common Parish Ranger, as our guest speakers who will be talking about “Looking after The Common”. There will also be a draw for the monthly winners of the CRA 100 Club which includes a chance to win £100 as well as three £10 prizes. There is still time to join the 100 Club and be eligible for this draw. Details are on the 100 Club page of the website and make sure you join before 30th April. It is not a requirement to come to the AGM to win the prize, but we would be delighted if you can join us. As we reported last month we have been pressuring Post Office Limited to re-establish a Post Office in Chorleywood. Residents and businesses in Chorleywood are suffering as residents are going elsewhere to get cash and do their shopping whilst there. Post Office Limited have reassured us again that a Post Office will be opened but it is all taking too long. We have been in touch with Mid Counties Co-op and Lords who are both interested in having a Post Office counter. Watch this space! In the meantime we understand Co-op already have an ATM on order and are awaiting installation. They also offer cash back of up to £50 on any value of purchase at the store. If you have elderly neighbours and are going to a Post Office, why not ask them if they want anything while you are there. These are the people most likely to be affected by the closure. Owen Edis, Martin Trevett and Yvonne Merritt have met with four members of Tfl to see inside the building and discuss possible uses for the interior. 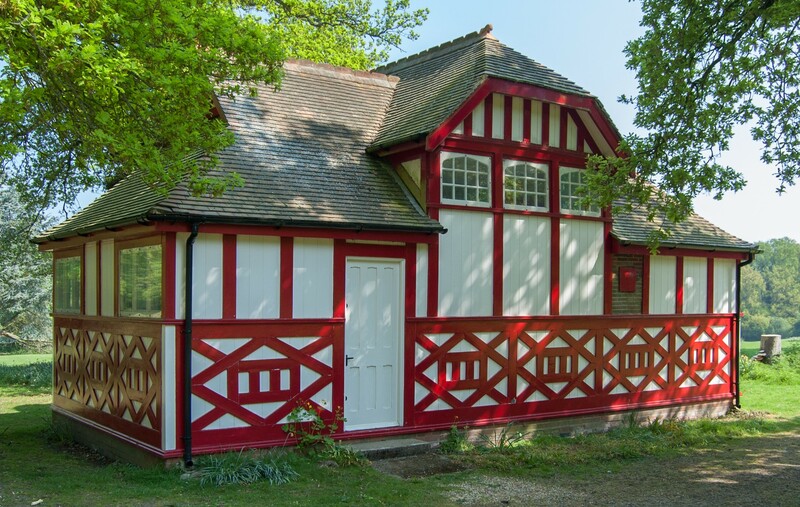 Initial thoughts are that it could be a picture gallery for railway enthusiasts as a kind of museum to complement the Lady Ela exhibition in the Summerhouse in Chorleywood House Estate. This could be open on bank holidays and Steam on the Met days. Obviously it would need some volunteers to develop the idea and man it when operational. Anyone interested please contact Owen Edis or Yvonne Merritt. Clearly the inside would need sprucing up, display boards fitted and safer access provided from the ‘Down’ platform. Martin Trevett has mentioned that TRDC have a Heritage fund that might be able to help with initial costs. Last month we advised you of the meeting about the new hospital project presentation at the Junction on Thursday 11th April. Regrettably it was not well attended which is a shame as it affects us all particularly future generations, and was an excellent presentation. Below is the link that tells you all about it. CRA have for some time taken an interest in this venture, and it now seems some progress appears to be being made. The project is raising funds to design the new hospital and the presenters hope to get an audience with the Minister of State for Health. We will keep you informed of progress. There are also leaflets available in the library headed - ‘Your Hospital : Your Future'. 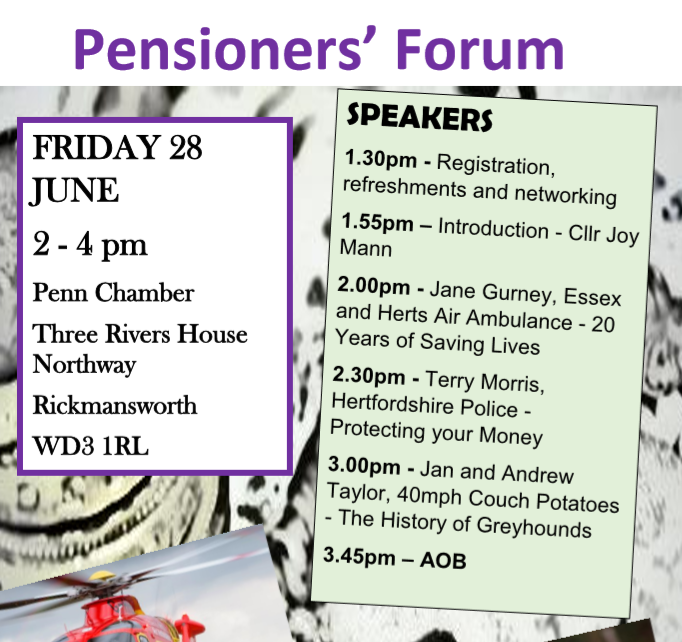 The next Pensioners’ Forum will be held at Three Rivers House, in the Penn Chamber, on Friday 28 June from 1.30pm for registration, refreshments and networking. Hertswise, the countywide project working to improve life for people with dementia and their carers, will be starting a social group at Sunrise of Chorleywood from the beginning of May. From Friday 3rd May, they will be meeting every week from 2.30-4.30pm in the Sunrise activities room, for tea and conversation, arts and crafts, singing, seated exercise, occasional speakers and more. If you or someone you know is living with dementia, come along to meet others in shared circumstances, make new friends, obtain advice, information and support, and have fun. The cost is £5 (carers come free of charge). Sunrise of Chorleywood is located at High View, WD3 4HA (next to the M25). For more information, please ring Mary Green, Three Rivers Locality Worker, on 07498 042088, or for more general advice and information ring HertsHelp on 0300 123 4044. Come and discover the history of Chorleywood House Estate, its residents, varied wildlife, plant species and interesting places to walk and visit. Chorleywood Choral Society performs regularly in the Chorleywood area, but every two or three years they take part in a larger event. Their next performance will be at the Royal Festival Hall on Wednesday 8th May at 7:30pm. 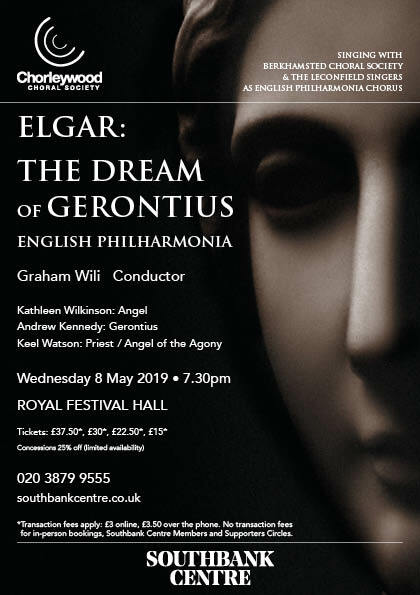 This is a great chance to hear the Choral Society performing THE DREAM of GERONTIUS, which is thought to be Elgar’s best work.